We first saw the Bosch 18V Multi-X pop up on the German website back in March, and then Bosch confirmed that it would be coming to the US when it made an appearance on their US Facebook page in May. 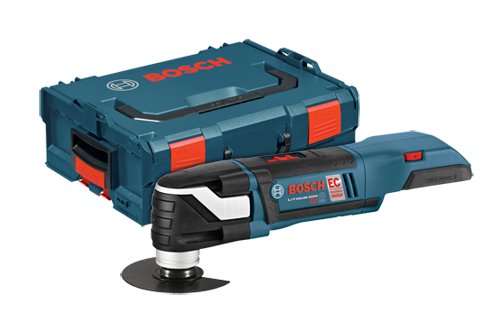 We have been anticipating the 18V Multi-X for a while now, and finally Bosch has given us a release date and a price to go with it. One thing I didn't spot when I first saw the new MXH180 Multi-X is that it features Bosch's new brushless motor technology. One of the issues with past 12v oscillating tools was run time; since brushless motors are more efficient, this should give the MXH180 that extra runtime we all need. Like the corded version, it features variable speed control from 8,000 to 20,000 opm, with an oscillation angle of 2.8-degrees. Other features carried over from the corded MX30 include: toolless blade change, OIS system, and metal gear housing. Unfortunately the 18V Multi-X will only be available as a tool-only kit. The $229 MXH180BL Kit does come with an L-BOXX, insert tray, and one accessory blade, but if you need a battery (4.0) and a charger, you will have to buy them separately for $99 (SKC181-101).